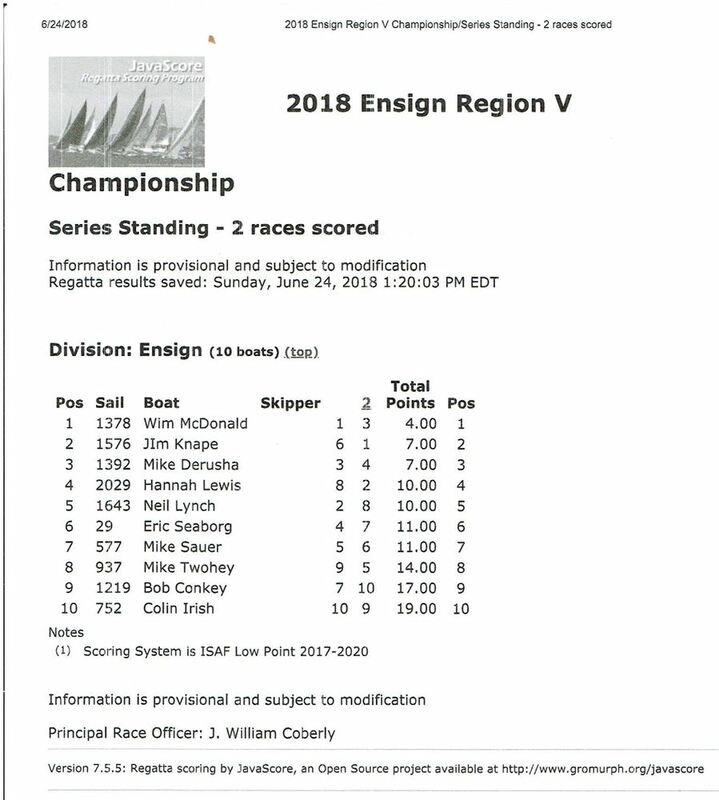 Ensign Fleet 35 and the Marquette Yacht Club played host to the 2018 Ensign Region V Championship Regatta on June 21, 22 and 23. After many months of planning the event kicked off with registration during the day on Thursday followed by a welcome party / fundraiser for the Marquette Junior Yacht Club and the Forest Roberts Theater youth acting group. With the help of many sponsors and a local pub the Inaugural Marquette Wine Tasting event was born. There were about 150 people in attendance on the evening of the Summer Solstice and the event included awarding a local dignitary the title of Marquette Wine Ambassador, a visit by a Tom Hanks Castaway look-alike complete with a Wilson volleyball and music by a popular local band Frank and da Beanz. Everyone woke up on Friday ready to race with a well-earned headache. Our races were run by PRO Bill Coberly from Kawkawlin, Michigan. Bill oversaw the ten boat fleet that included Bob Conkey who brought the Ensign Bus from Cleveland. Bill was put to the test on Friday working hard with local volunteers in a futile attempt to get the fleet a race. The wind would tease the committee and the fleet but would not fill in with enough authority to get a race off. After bobbing for the better part of the day and being entertained with trivia questions and “Dad” jokes over the radio we finally called it a day on the water without completing a race. The lack of wind did not dampen the spirits of the competitors. As soon as the boats docked the party picked up where it left off the night before. Those in attendance managed to run the club out of beer. The organizers were not to be out done and quickly re-supplied the party. The skippers and crews then took a leisurely stroll to visit one of the many fine restaurants within a few blocks of the club. The forecast for Saturday was for more light wind, however, Mother Nature cooperated just enough to allow the Race Committee to get two of the three races scheduled completed. There was a huge cheer when the first boat finished the first race on Saturday as that meant that it was officially a regatta! Wim McDonald traversed the light and shifty winds and was able to take advantage of a shift on the last leg to earn the win. After a little more patience the wind filled in and the committee wasted no time sending the fleet off on another race. This time it was Jim Knape who was able to make the most out of the second light air race as he crossed the finish line in first place. Unfortunately that was all the racing to be had and after waiting for what to some seemed like an eternity the regatta was called complete. We owe our thanks to the Race Committee consisting of Bill Coberly PRO, Gordon Mortensen, Austin Fogt, Pete Kelly and Marty Paulsen Sr. They all worked their butts off to get two races in. There were many other volunteers who worked behind the scenes to put the event together. We also wish to thank our sponsors who gave their time and talents to make our event special. With this year’s Regional Regatta in the books we are now looking forward to attending next year’s Regional in Cleveland and hosting the Ensign National Regatta in August of 2020 in Marquette. We would like to take this opportunity to cordially invite you, your family and crew to attend what will be another fantastic event in Marquette.